Rich, cheesy and saucy, with hearty chicken and healthy quinoa, this Chicken Parmesan Quinoa Bake takes all the flavors from your favorite Italian dish and bakes them into a hot, comfort food casserole you’ll want to warm up with this Winter. It’s been pretty chilly here in Buffalo for the past few days. You may have seen a few stories on the news (assuming you aren’t living under a rock) about the record 70”+ snowfalls and the poor folks who got stuck in their buried cars or who opened their front door to a wall of snow. I did get a few messages from readers asking how I was holding up, so thank you to those who expressed concern. Buffalo’s mayor said the other day that the snowfall in Buffalo is like “a tale of two cities,” and he couldn’t be more right. The Southtowns generally get the brunt of any lake effect snow, and they were slammed by this recent storm. Those of us who live north of the city, however, were mostly spared. Where I live, we had several days of clear, sunny skies with a light dusting of snow on the ground, followed by a couple days of a completely normal, manageable amount of snow (clear roads, life unaffected). I, along with much of the country, watched the news in shock and saw the pictures my friends posted on Facebook of the crazy snow they were getting. My heart goes out to the families and friends of the few who passed away in storm-related incidents. Have no fear though, unlike the places some of you may live, our area is pretty well-equipped to deal with these types of weather events and get back to normal living. Buffalo will be good to go in no time. Although I wasn’t stuck inside, with the cold temperatures, the thruway closed, and driving bans in several nearby areas, all I wanted to do was stay inside by the fire with warm slippers and a cozy blanket. What goes perfectly with chilly outdoor temps? Hot, cheesy, comfort food casseroles. 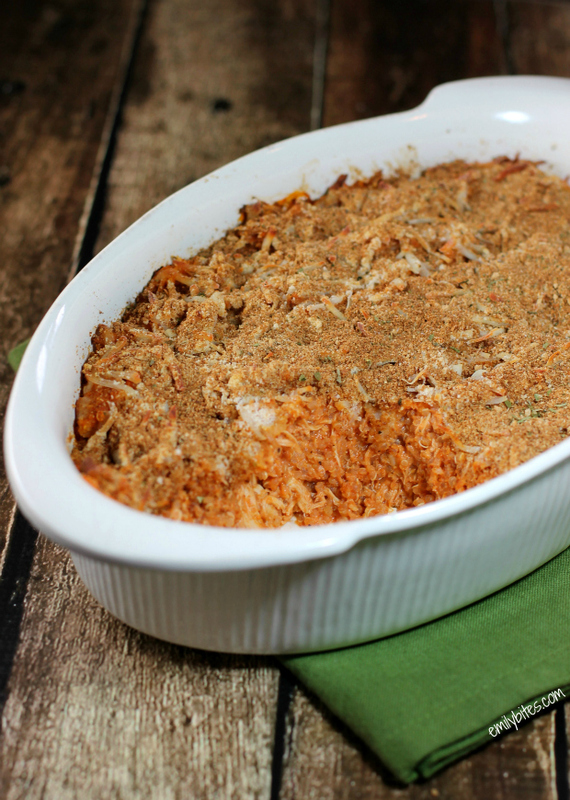 Ever since I posted my Buffalo Chicken Quinoa Bake, I wanted to make a similar bake using different flavors, and this was the perfect time. This casserole is amazing. It’s warm and satisfying and it tastes decadent even though it’s only around 350 calories or 7 Weight Watchers SmartPoints per serving. I easily see this becoming a regular dish in our meal planning because my husband and I were both blown away by it. 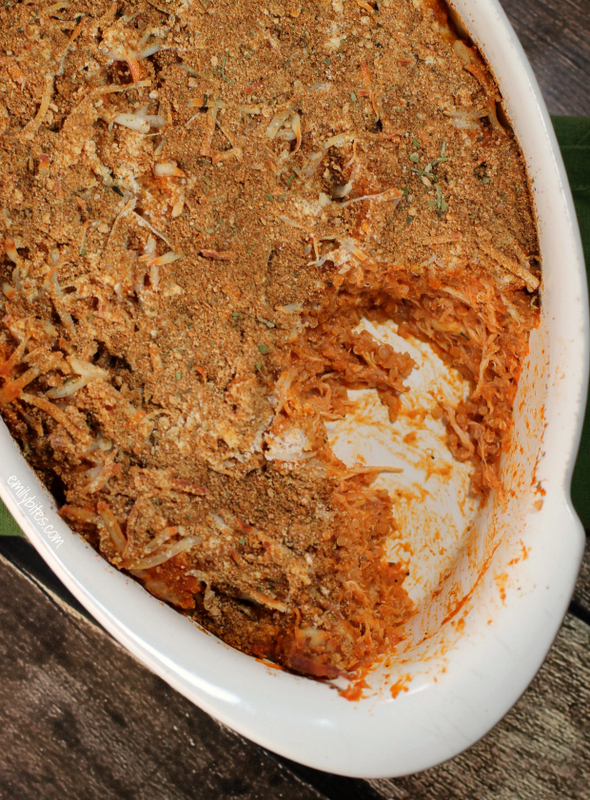 Don’t forget to check out my Easy Slow Cooker Shredded Chicken post- the perfect way to make shredded chicken for this recipe! How easy is that? Trust me, you’re going to love this one. Pre-heat the oven to 350. Lightly mist a 2 QT baking dish (such as 7×11 or 9X9) with cooking spray and set aside. In a large skillet or saute pan (with a cover), bring the oil over medium heat. Add the onions and cook for around 4 minutes, stirring occasionally until they start to become translucent. Add the garlic and stir together. Continue to cook for another 30-60 seconds until garlic is fragrant and starts to turn golden. Add both cans of tomato sauce and reduce heat to low-medium. Stir in the Italian seasoning, salt, lemon juice, sugar and red pepper flakes. Add the cubes of cream cheese and stir until dissolved into sauce. Cover and cook for 5 minutes. Remove from heat and add 4 tablespoons (1/4 cup) of the Parmesan cheese and ½ cup of the shredded Mozzarella. Stir in until cheese is melted and absorbed into sauce. In a large mixing bowl, combine the quinoa and shredded chicken and stir together. Pour the sauce over the top and stir until well mixed (chicken and quinoa should be fully coated in sauce). Transfer the quinoa mixture to the prepared baking dish and spread it out evenly in the dish. Top with the remaining ½ cup shredded Mozzarella and 2 tablespoons Parmesan. Place the bread crumbs in a dry skillet over medium heat and brown bread crumbs for a few minutes, stirring frequently until golden. Sprinkle the toasted bread crumbs over top of the casserole and bake in the oven for 35 minutes until hot and bubbly. LOVE your quinoa addition here… just about anything with quinoa is a favorite in my book. I have a hungry 18 year old boy, I think he could polish off a good amount of this dish!! I want THAT for dinner! Glad to hear that you are safe. The pictures I have seen of the area are incredible! This looks like the perfect comfort food for crazy weather! The title had my interest piqued, the pictures have me salivating. I am pinning this, and might just sub some left over turkey next week and have this as a leftover meal. Fabulous! This recipe sounds wonderful! Thank you – I really enjoy your blog. It’s so funny when you find out one of your favorite bloggers actually leaves in your area of the country. For some reason, I always think bloggers live far away LOL! I’m in Rochester but my daughter goes to school in the Buffalo area — and she got slammed! Go figure with lake effect! I’m so looking forward to trying this. 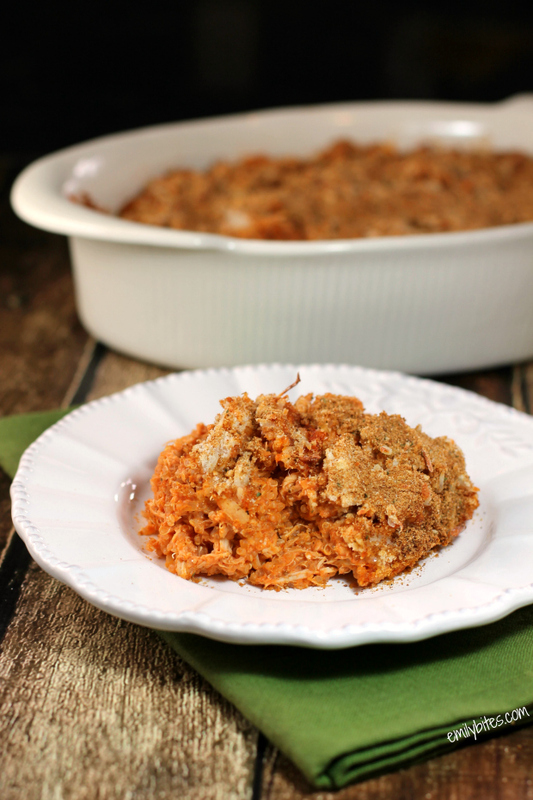 The Buffalo chicken quinoa recipe is my favorite and I’m actually going to make both of them next week! I just made this for dinner tonight, and WOW. I have to admit, I was very hesitant – don’t laugh, but I’d never had quinoa before. Oddly enough, neither had my 66-year-old mother, and she was rather skeptical. This was absolutely delicious, though, and incredibly filling and satisfying – my mother and I together were only able to finish a quarter of it, but that’s okay, we’re excited about the leftovers. Thanks so much for posting all these recipes. I only started cooking about six months ago to try to get healthier and slim down, and your blog has been a lifesaver! Please know you are very much appreciated. Thank you so much for the kind words!! I definitely don’t think it’s weird that neither of you had quinoa until now, this was my husband’s first time trying it too! I’m thrilled you both loved it, thanks for letting me know. Happy cooking! This meal was even better than I thought it would be. My husband and I loved it so much! I think this is going to be a regular in our household. Thank you so much Emily! Have you considered making a quinoa bake with a Mexican feel? Sort of like taco meets quinoa? I’m kind of obsessed with the quinoa bakes — they are so filling and tasty! I have! A Mexican themed quinoa bake is on my to-to list, I was thinking maybe with a cheesy enchilada feel. Stay tuned! 🙂 I’m so glad you both loved this one! Yum! I’m so glad I tried this because it’s delicious! I baked in a 9×13 since it looked like a good amount and it came out perfectly! Definitely going to add this one to the rotation! I bet it would be a good prep ahead meal too. Great, I’m so happy you loved it! Trying the Cheesy Taco Pasta tonight – can’t wait! Anyone know the sodium total of this dish? It doesn’t show on Myfit and it’s the one thing I gotta look out for! Thanks! I have to say – you finally got me to eat and enjoy quinoa! I have tried to make it previously and although I love other grains like bulgur, barley, faro and couscous – the previous quinoa recipes I made I couldn’t eat. I honestly thought they were gross. I am back at weight watchers and I kept seeing a bag of quinoa at Aldi. I discovered your website and this recipe – and after several weeks debating – I decided to give it a try. While it was a lot of pots and pans – and the fact that I still find the smell of plain cooked quinoa off-putting – the finished dish was delicious. I told my 6-year old twins it was couscous (which they like) – and they gave me no problems at all. “I like the crunchy parts Mommy!” I made too much quinoa ad chicken so I was able to whip up a 2nd half pan to freeze. And I have plenty of leftovers for later this week. I grew up eating Italian food – and this hit all the right notes. The portions were big and filling. And once the sauce and cheese were added – the quinoa became delicious. I would love to see a Mexican version of this recipe – or maybe even something a bit indian. I love this since I don’t eat rice – and am always looking for rice alternatives. Thanks so much. Ok.. so I made WAY too much quinoa and was in such a hurry I didn’t even realize it until I had the dish in the oven. I thought for sure I had ruined it and we would be pulling out some sandwiches. However, even though the ratio of quinoa to … everything else was way off.. the flavor was delicious. I was stunned at how well it turned out and can’t imagine how good it would be if I had done it correctly LOL! We are big fans of quinoa at my house. We love this recipe. Last night, I made a variation by substituting half the chicken with crumbled, sweet Italian chicken sausage. It was fantastic! Emily, if I measured the shredded chicken by the cup (instead of ounces), approximately how many cups would I need for this recipe? I like to cook large batches of shredded chicken in the crockpot then freeze in smaller portions in ziploc bags. I have 2 cup bags in my freezer right now.